We have spent the day outside and enjoyed the warmth of 15-C sunshine. There was no biting cold wind, so you could enjoy the warmth.The dogs loved it.Hubby has been busy getting the weeds out of the veggie patch. I have been busy doing a lot of spring cleaning inside the house, when the weather has been bad. I have a pile of mending to do but I keep procrastinating in hopes that it will disappear on its own. It has not worked yet. I am trying hard to get that done before Easter and our growing season begins. 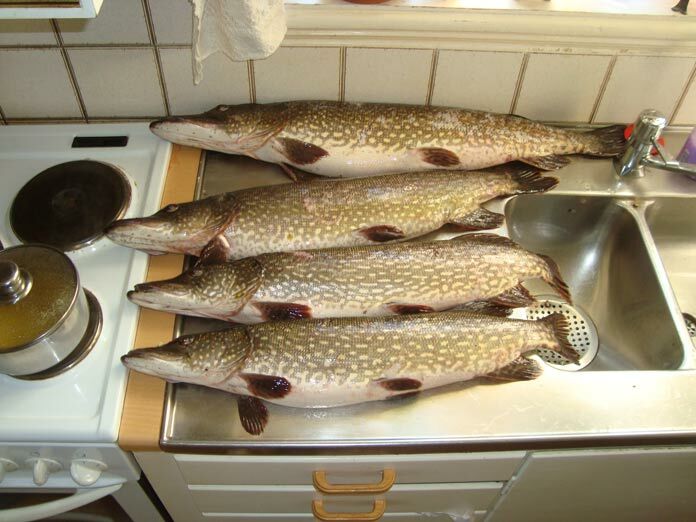 Our Neighbor L came by this evening with four large pike for us. That was such a welcome treat. Hubby skinned and file them and they are now sitting in our freezer in the basement.